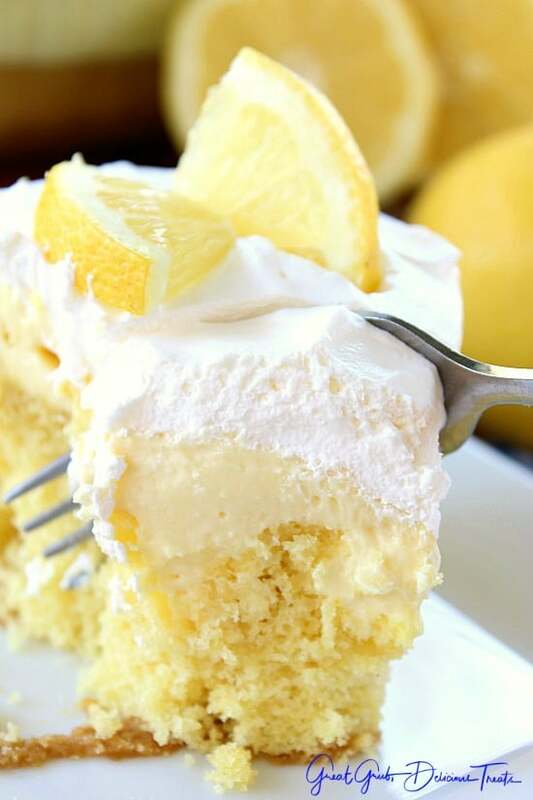 This cream cheese lemonade poke cake is super refreshing, tastes amazing and is perfect on a hot summer day. 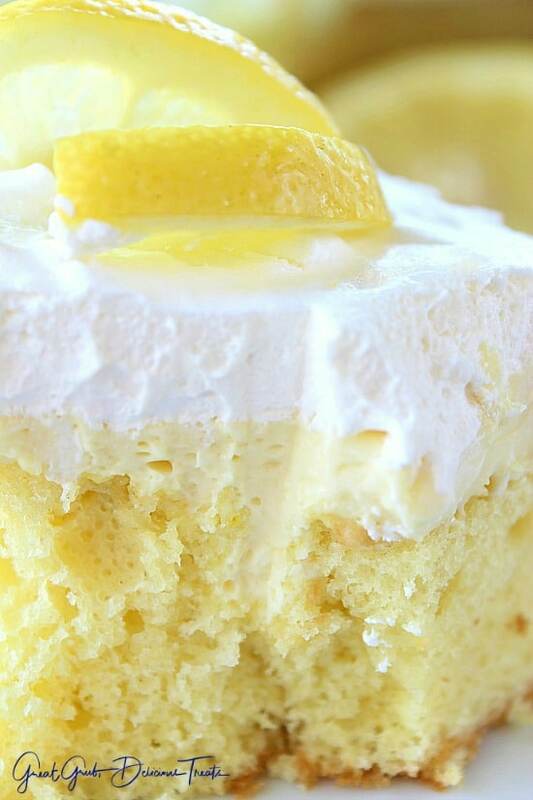 The lemon cake is so moist, then topped with the delicious cream cheese lemonade pie mixture, and next, cool whip topping, and finished off with sliced lemon slices. Makes for one DELICIOUS dessert. 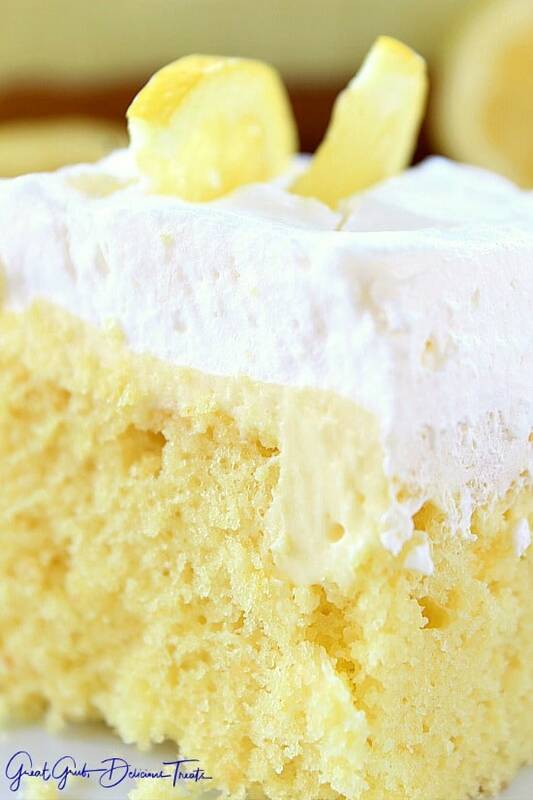 My cream cheese lemonade pie has been such a hit, and is the most popular recipe on the blog, so I decided to make this fabulous cream cheese lemonade poke cake using the same pie filling in that delicious dessert. AMAZING! So basically, just get a lemon cake mix and prepare it as directed. Let it cool and then poke holes all over the top of the cake. 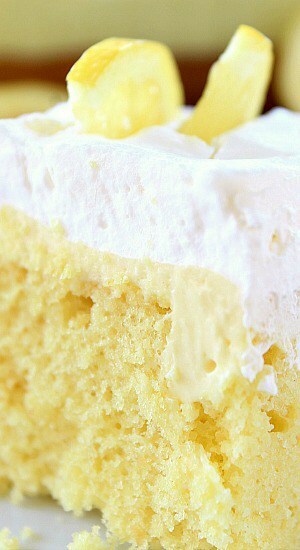 Make the cream cheese lemonade pie mixture and spread all over the top. Try to get some down into the holes. Cover with plastic wrap and put in the fridge for 4+ hours or overnight. After the pie mixture has set up, top with cool whip, garnish with sliced lemon slices and serve chilled. A great cake to serve this 4th of July. Super tart, super refreshing and everyone will LOVE it. I promise! 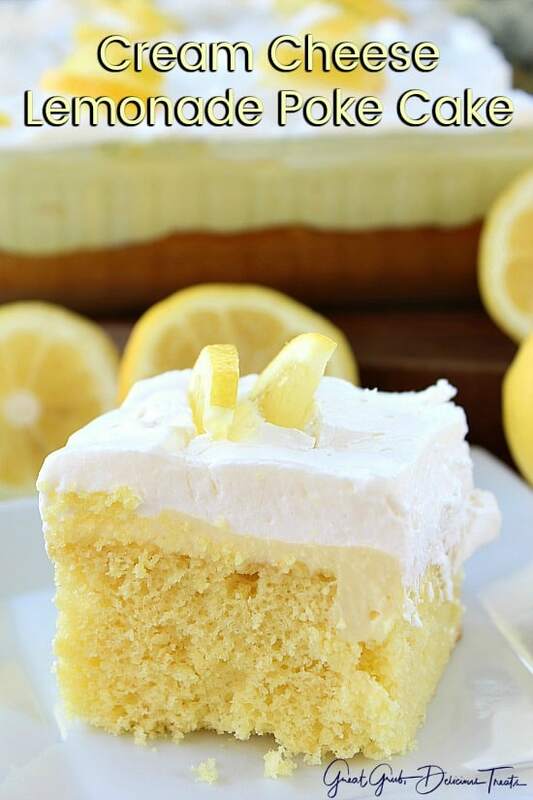 If you want to get real creative, make a homemade lemon cake. 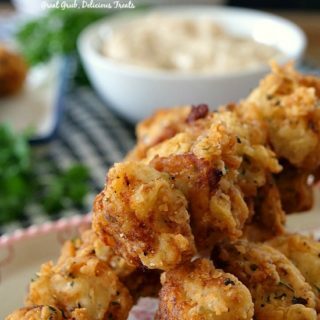 I have one here that I made a while back that is so good that will work wonderful with this recipe. Just cut the ingredients in half and it will make a 13 x 9 cake. 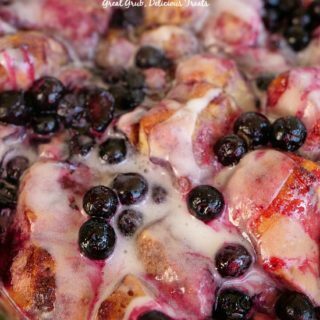 I wanted something fast and simple, that tasted great, and had the tartness of lemon to enhance this dessert even more. Welcome the addition of the cream cheese lemonade pie mixture. 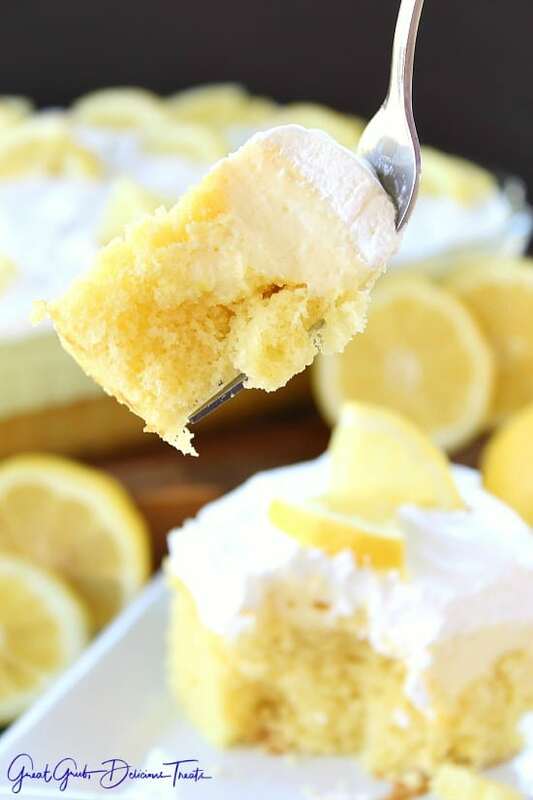 I was super excited thinking of making this dessert knowing how delicious the pie is and knowing how delicious a lemon cake is, and then to combine the two. HEAVEN! 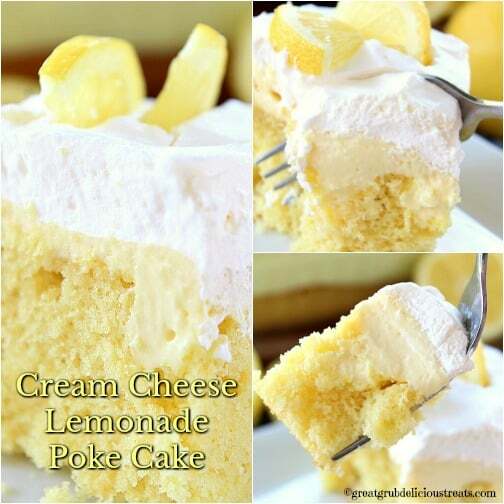 So many others have been able to enjoy the deliciously tart pie and now can enjoy this delicious cream cheese lemonade poke cake too! 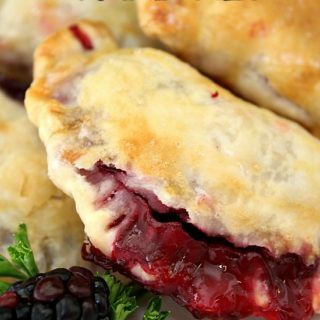 I’m so fortunate to have received that pie recipe from my friend Dawn. She has some great recipes and some I haven’t even made yet but I will. Stay tuned. Preheat oven to 350° and grease a 13 x 9 glass baking dish. Set aside. Mix cake mix according to package directions and bake for 23 minutes. Once the cake has cooled, make multiple holes with the bottom of a wooden spoon over the entire surface of the cake. For the pudding mixture, mix pudding and evaporated milk for 2 minutes on medium speed. In a separate bowl, beat cream cheese for 3 minutes on medium speed. Add lemonade concentrate and continue mixing until well incorporated. Spoon pudding mixture into cream cheese mixture and mix until well blended. Pour over cool cake, spread with spatula. Cover with plastic wrap and refrigerate for 4+ hours or overnight. 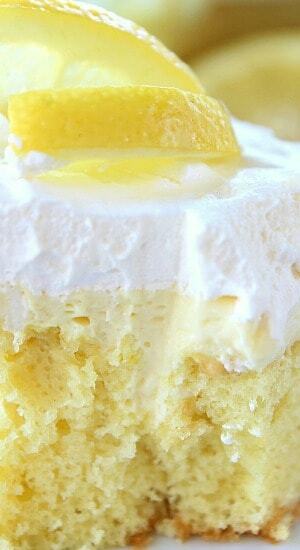 Top with cool whip, garnish with lemon slices. I tried the cake and followed the directions carefully. The pudding mix was not pourable and more of a pudding consistency. It did not penetrate through the holes though I tried to push it down the rather large holes. The cake was not moist. Any suggestions – I so wanted to love this cake. Wonder if you could make this a layer cake??? 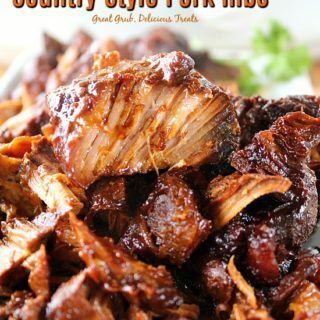 Hi Vickie, I think it would and I am going to try it one day soon. I would say to make sure that the “poke holes” are large enough to get the lemonade pie filling down in there so it’s a thinner layer between the layers. 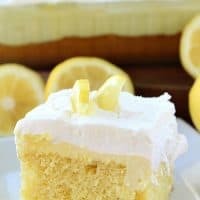 I can only imagine how good it will be with the lemonade filling saturated throughout the cake. 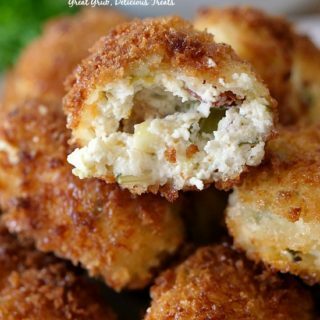 Yep, I’m making it SOON! 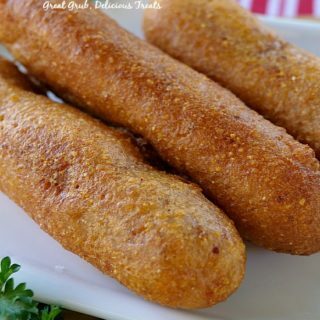 I’m so making this for the 4th of July next week.